I have always been able to hear extremely well, able to pick up the crunch of deer hooves at long range and zero in on the direction and location of those sounds. Hearing has been my greatest attribute as a hunter, and to know I’ve lost even a bit of that is disturbing. Audiologists point out that exposure to noise greater than 140 dB can permanently damage hearing. Almost all guns create noise over that level. A .22 can produce noise around 140 dB, while larger calibers can produce sound over 175 dB. Every time you fire a rifle, you create noise that can damage your hearing! The left ear (in right-handed shooters like me) often suffers more damage than the right ear because it is closer to, and directly in line with, the muzzle of the firearm. Also, the right ear is partially protected by the head and gun stock. Shooters tend to have high-frequency hearing loss, which according to audiologists means that they may have trouble hearing speech sounds like “s,” “th,” or “v” and other high-pitched sounds. 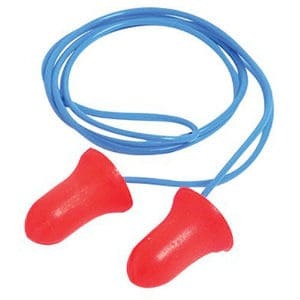 At the range, I always wear hearing protection, and I try to double up, with foam ear plugs and muffs over them. But in the woods I have never worn plugs, feeling a need to hear deer coming. I am going to change that ASAP this season by keeping plugs and even muffs handy, depending on the situation. It’s going to be a hassle, and I don’t want to do it. But I dread the alternative. When in a tree stand or fabric ground blind, I am going to wear pair of foam plugs linked with a cord around my neck. 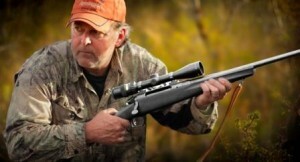 Plan is to hear a buck coming, see him, get ready, put in plugs and then take the shot. As I said, hassle and one more thing to think about, but gotta do it. You should too, no matter how old you are. When I hunt from a wood or metal box blind, I’ll use the plugs or maybe even muffs. Firing a rifle in an enclosed place where the shot reverberates and bounces off walls makes the noise louder and increases the risk of hearing loss. Always wear some type of ear protection in a box, starting today! Doc says that while I have a bit of hearing loss, I can prevent more by ALWAYS wearing ear protection every time I fire a gun and when people nearby shoot a rifle. Follow my lead and wear your “ears” on every shot. If you are in the market for a new deer rifle for 2018 head to the nearest Cabela’s or Bass Pro until August 26 and grab a Remington Model 783 for a tad over $300 with tax. 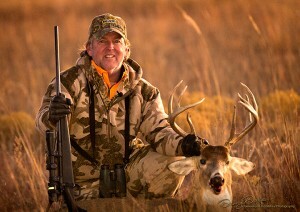 This is an unbelievable deal for one of the most accurate and dependable deer rifles I have shot in the last 6 years. I was the first blogger/hunter to shoot and test the Model 783, back in the fall of 2012. Later that November my friend John, who at the time worked for Remington, shot the first buck ever with the 783 on a hunt with me in Saskatchewan. We filmed the hunt for that 160-inch giant for my show Big Deer TV on Sportsman Channel. When I posted my first review on the Model 783 in January 2013, I had shot the rifle in .30-06 quite a lot, but I had never killed a deer with. I have since shot 10 bucks with the 783, 4 with one chambered in .30-06 and 6 with my favored .270. I tell you from experience that the no-frills Model 783 is a functional, reliable, accurate and affordable rifle that is designed: 1) to shoot MOA groups all day with Remington or Barnes factory ammo; and 2) put venison on the table. At $300 it’s the best rifle bargain I’ve seen in years. Click here to research the Model 783 and see the specs before you buy. What Happens To Ammunition In A House Fire? Grant said most of his stored hunting ammo had simply burned up; a few cartridges had exploded, as evidenced by holes and dents in the gun safe’s walls. The photo here of burned ammo is from the fire at Grant’s. Turns out, this is typical of what happens to ammunition in a house fire. 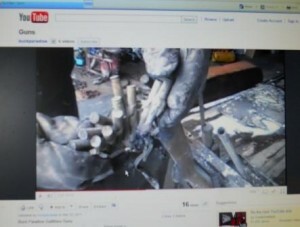 According to this KRCR News report, fire officials say that burning ammo is not as dangerous as you might think. The popping noise people hear when ammo is burning is not the bullet flying away from the casing with any force, regardless of what you may have seen in the movies. He says the best place to store ammo is in a dry spot and in a wooden container. Much has been printed and broadcast recently about soft firearms sales. According to the liberal mass media outlets and their hatred of firearms, the gun industry is on the brink of death. Nothing, however, could be further from the truth. You can do your part to help drive up firearm ownership numbers in the months ahead. Go shopping. Those who watch firearms sales follow the NICS background checks numbers. May 2018 set an all-time monthly record for NICS checks—the federal gun clearinghouse for those making a firearms purchase. In most recent months, the monthly sales total has been around or above 2 million firearms purchased. Many are being purchased for self-defense, but hunting and recreation are also huge uses. With hunting seasons and National Hunting and Fishing Day (Sept. 22, 2018) on the horizon, you should make plans now to buy another firearm. –Guns provide hours of fun for you, family and friends. –Firearms can be used to protect you and your family and friends. –Guns provide food when you go hunting. What will your next gun purchase be? Start shopping. Good news is that many places are having sales fight now to make way for the new 2018 models. 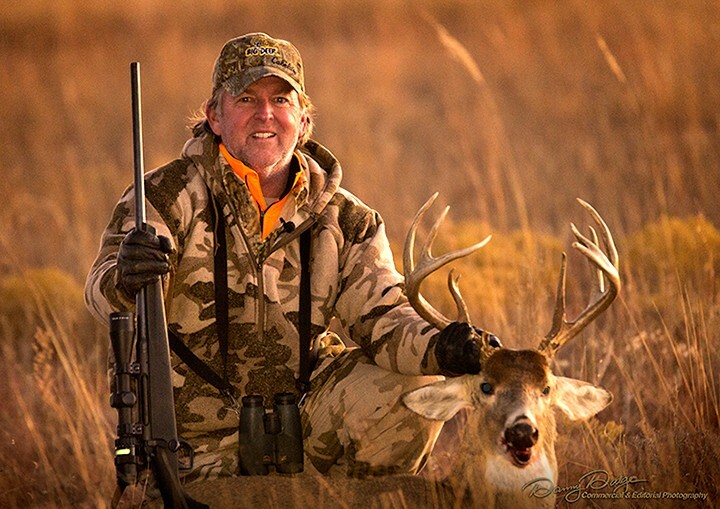 Photo: Hanback with one of his favorite deer rifles, Remington Model 783 in .270 topped with Trijicon’s world-class 3X-9X Accupoint scope. 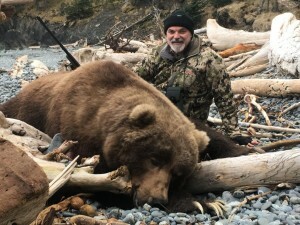 The hunt took place in a special draw area on the northern end of Afognak Island in the Kodiak chain. It took 3 years to draw the permit. I booked the hunt through Wade Darby at Crosshair Hunting Consulting. Wade booked me with Afognak Wilderness Lodge, which has an extremely remote camp that the Randall family has chiseled out of the Afognak wilderness over the last 50 years. It is an impressive camp considering every single thing was either made from the rocks or trees growing on the island, or brought in by float plane or boat. We left base camp every day by boat, and after about an hour’s ride to our permitted hunting area we glassed from the boat along the shore lines and hillsides. We concentrated along the beaches at low tide. When we spotted a bear and determined it was a good one, we launched a Zodiac with a small motor and maneuvered to shore to get a closer look at the animal. We saw from 5 to 20 bears each day. Many were inaccessible and we simply watched to see if they would move or feed into better position, which rarely happened. One day we spotted a bear, launched the Zodiac and got into position. My guide, Josh Randall, immediately realized we were looking at an exceptionally good one. After a good bit of slipping and sliding we were able to get into a good shooting position on a slime-and-barnacle covered rock along the beach. The bear fed towards us, flipping over rocks and driftwood looking for food. I shot the bear squarely in the front shoulder with hand-loaded 270-grain Barnes TSX from my .375 H&H. Hit hard with the first shot, it spun and snapped a few times. I followed up with a second shot and the bear dropped on the beach within 40 yards. I feel extremely fortunate to have had an opportunity to harvest such a majestic animal like this. Walking up to this bear was like a dream. I was in shock at the sheer size of the animal. The hide was spectacular, heavy and thick. Its head was massive. My guide Josh was as excited as I was. We were able to get the main boat to the beach and winch the bear onto the front of the boat to return to camp for skinning, which was an all-day affair. Tech notes: Sam Fullerton is a well-traveled big game hunter and hand-loader. Sam reports that while skinning the bear, he recovered the first Barnes TSX bullet, which had entered the front shoulder at a slightly quartering-to angle; it was bulging under the hide just in front of the opposite side rear hip. “Perfect bullet performance with nearly 100% weight retention,” he says. Sam has also used the Barnes TSX in both 270- and 300-grain on a variety of African big game with the same impressive results.